This chapter delves into family explanations, starting with types of family violence—filial violence, intimate partner violence, child maltreatment, filicide and elderly abuse—and then family risk factors for later offending. There are six types of family risk factors that have been identified, and we look at the relevance of these in light of the findings from Japan. 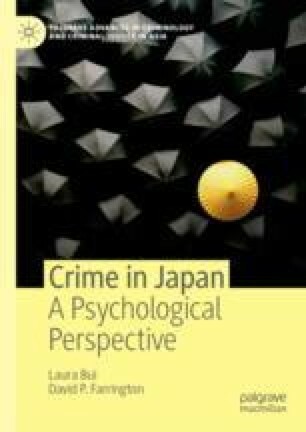 One type of risk factor that has not been studied in Japan is family criminality, or the intergenerational transmission of crime. A primary challenge in effectively addressing family violence is societal perceptions of the family and women. The Japan Times. 2017. “Waking up to Child Abuse.” Accessed 31 May. http://www.japantimes.co.jp/life/2014/09/13/lifestyle/waking-child-abuse/#.WS602BP1DPA.